Hamilton High School’s yearbook, The Lance, earned the All KEMPA award, Kettle Moraine Press Association’s highest rating of excellence. 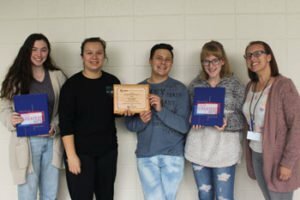 Lance members learned that their 2018 yearbook, “Our Greatest Hits,” earned the prestigious award Oct. 12 at the annual KEMPA Fall Scholastic Journalism Conference. The conference was held on the University of Wisconsin – Whitewater campus. Students Cassie Dondlinger and Jakob Nowak attended the conference along with Hamilton special education teacher and yearbook advisor Nikki Hammer. Other students who were members of the extracurricular club when “Our Greatest Hits” was created but not able to attend the conference were Abby Meihsner, Juliette Mattair and Nathanael Moss.